Prior to update 173, Druids had 2 forms of transformation and the Battlemagician had only 1. The one form that the Battlemagician had was unfortunately useless in almost all aspects of the game. While the vision of the Druid was a transformation master that used skill in their transformed state to fill almost any role in a group, the class instead used out of transformation skills in order to do most of their work. Post update 173, we envision the classic image of the Druid class. We moved the Vilovy form into the Druid tree which will specialize in defensive measures as well as escape. We enabled the Vilovy form to be able to use skills and attack in this form, unlike it's previous limitations. 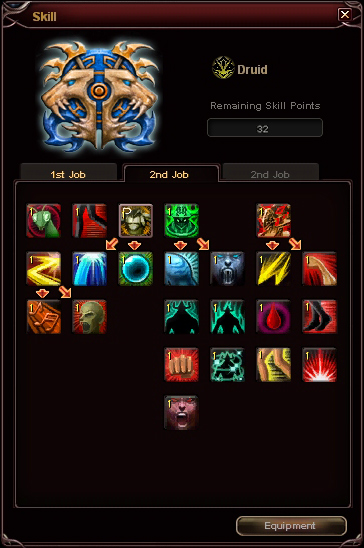 Several old skills that were used outside of transformations have been placed into the Vilovy tree which also means the player must be in that form in order to do the skills associated with it. Contract of Vilovy: Transform into Vilovy with high movement speed. Change: Contract with Vilovy becomes a Druid only skill. Advance: Rush forward at high speed. Change: Advance now requires Contract with Vilovy and transformation to activate. Space Activation: Quickly teleport away from your current position in a random direction. Change: Space Activation now requires Contract with Vilovy and transformation to activate. Swift Leg: Increase moving speed for a short period of time. Change: Swift Leg now requires Contract with Vilovy and transformation to activate. Revenge Telekinesis: Add magic on magic weapon for attacks. \nAdd a chance of generating a physical attack reflection shield. Change: Revenge Telekinesis now requires Contract with Vilovy and transformation to activate. Gravity Up: Increase magic skill casting time of a target and surrounding enemies. Change: Gravity Up now requires Contract with Vilovy and transformation to activate. Cry of Will: Increase Physical and Skill Critical Attack Chance of a target and yourself for a certain period. Change: Cry of Will now requires Contract with Doomguard and transformation to activate. Robbing Willingness: Deal a great amount of damage in order to shred your opponent's armor for a short period of time. Change: Robbing Willingness now requires Contract with Inferno and transformation to activate. Promise of Trust: Increase Defense of target and yourself. Change: Promise of Trust now requires Contract with Inferno and transformation to activate. These changes are still subject to change. good job on this one! increase aggro skill for taunting cry by 5x. Right now druids cant hold aggro as tanks with that skill. Also increase damage for Inferno's skills, right now everyone just uses it for the stun skill. will the buffs still be in effect after returning to regular form or other transformation? dont like...the transformation only... buffs should be available to all transformations. looked bm everything is ok except transformation only skills.. redundant and they are kinda useless..
Edited by sonemere, 07 November 2014 - 02:59 PM. why shape shift after all? for some it might feel like an obstacle ofc. 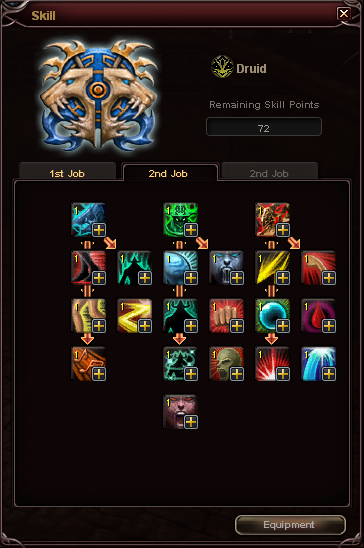 its not more that easy to Spam all kinds of skills. lul @ self buff changes. RW change is so-so, but combined with AE and RS being changed to magic dmg it doesn't really provide much for a physical play style anymore since those options now get thrown out the window. Edited by Viole, 07 November 2014 - 07:07 PM. I'm expecting good changes on commi as well, we need more power!!! Where the noses is said Vilovy is useless? I used to use it with my elementalist to get high speed when I used to play. Too many changes over the years. Could you please iluminate us with the answer everybody is waiting for? WHY! yes, why those changes, what kind of perturbated mind do they come from? and most important, why do you follow such instructions, even knowing that will doom the game. It's past time you gave us an answer. Dont ruin the druid... keep the buffing without transformation and gravity up also..